SINGAPORE - The People's Power Party (PPP) has revealed its team contesting the Chua Chu Kang group representation constituency (GRC): It will be led by party founder Goh Meng Seng, 45, and also includes finance and administrative manager Low Wai Choo, 55; property consultant Lee Tze Shih, 42, managing consultant Syafarin Sarif, 39. 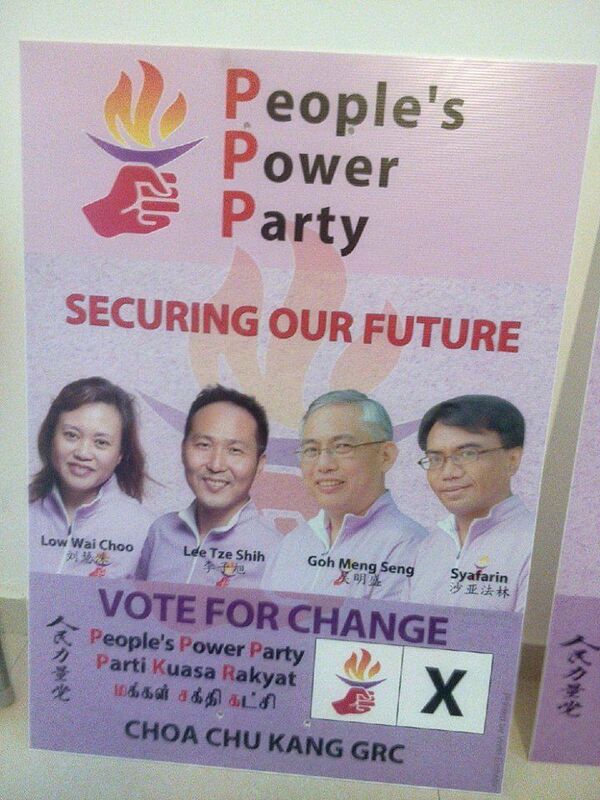 The Straits Times received a photo of their campaign poster, removing the suspense over the PPP's team, which had conducted its election campaign without media attention. The party had not formally introduced its candidates for its sole battleground at the Sept 11 polls. Some of the team members on Tuesday (Sept 1) morning had breakfast at a shopping centre located near the nomination centre at Chua Chu Kang Primary School. The PPP team will challenge the People's Action Party (PAP) incumbents consisting of Health Minister Gan Kim Yong, 56, Parliamentary Secretary Low Yen Ling, 40, backbencher Zaqy Mohamad, 40 and joined by newcomer Yee Chia Hsing, 44, a banker. In the 2011 General Election, a PAP team won 61.2 per cent of the vote against the National Solidarity Party (NSP) in Chua Chu Kang GRC, which was then a five-member constituency. Mr Goh is former secretary-general of the NSP and a member of the Workers' Party team that lost in Aljunied GRC in 2006. Mr Syafarin stood in Tampines GRC under the NSP banner with Mr Goh. Ms Low is currently facing public nuisance charges for her part in a Hong Lim Park protest rally on Sept 27 last year. She is among six protesters accused of disrupting the YMCA Proms @ The Park charity event for children with special needs, which was held in Hong Lim Park at the same time as the Return Our CPF protest rally. The maximum fine for the charge is $1,000 and she is still able to run for the election. Mr Goh said previously the party decided to contest the GRC because the opposition won considerable support in the western part of Singapore in the 1980s and 1990s. The party is likely to focus on healthcare and immigration issues this election, with Mr Goh saying earlier that population growth had "reached a dangerous social boiling point".